This new catalog is chocked full of wonderful new products for card making, scrapbooking, home décor and parties! Including tons of new stamp sets (most available in clear mount and wood mount), exclusive Project Life scrapbooking products from Becky Higgins, a new line of alcohol based markers (for more info on these markers check out my recent Blendabilities review), In Colors (in ink pads, markers, cardstock, ribbon and twine), trendy pattern papers, lots gift and party packaging sets (boxes, bags, tags, labels and banners), card kits (including carving your own stamps), die cuts (many of which co-ordinate with stamp sets), embossing folders, embellishments (like new sequins, metal paper clips and mini clothes pins), ribbons, masks and much more! The catalog is also full of wonderful ideas, inspiration, project samples and how to’s. This will be the first of several posts sharing some projects I’ve made using some of the brand new Stampin’ Up products, I hope they inspire you! 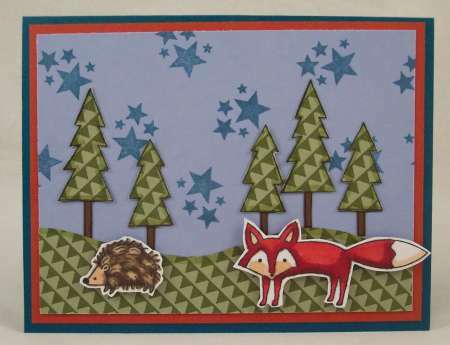 For my first card (shown above) is used the adorable Life in the Forest stamp set, I love woodland animals so this is one of my favorite sets! On blue cardstock I randomly stamped the stars from the Project Life Point and Click clear stamp set and layered it onto rust cardstock on a teal card base. I stamped the trees onto one of the pattern papers from the All Abloom paper set and cut out the tops, layering them onto brown cardstock for the trunks. I also used the same pattern paper for my hills, cutting a wave shaped and adhering them all to the star paper. On white cardstock I used black Memento Ink and stamped the fox and hedgehog stamps, coloring them with the new Blendabilities alcohol based markers. To give some “texture” to the colored hedgehog I used the Color Lifter marker to lighten and remove some of the marker color. For my next card I used the fun new Circle Card Die which makes a neat fold out card that flips in the center. I die cut the base in white and also again in two pattern papers from the All Abloom pattern papers, adhering those to the front of the card. 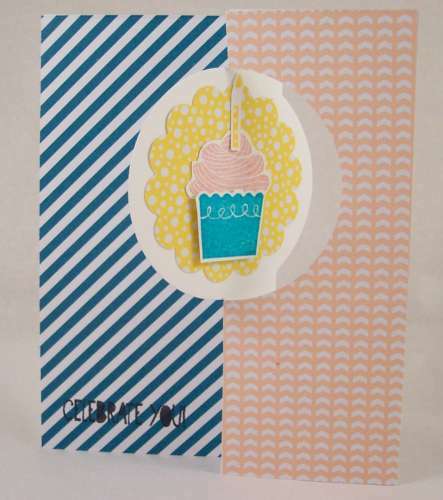 I die cut the scalloped circle using another All Abloom paper, adding that to the center circle of the card. I stamped the cupcake base, top and candle from the Cupcake Party stamp set in different inks colors, cut and layered them in the center with foam dots. Then I stamped the sentiment in black ink on the front. It’s such a cool dimensional card! For my last card I used the new Traveler stamp set, which is perfect for masculine cards! On a red cardstock based I layered a piece of pattern paper from the Maritime paper set and then I stamped the boat in blue ink on white cardstock and layered it onto a piece of red and adhered that to the front of my card, adding a metal paper clip from the Everyday Adventure Project Life Accessory Pack. 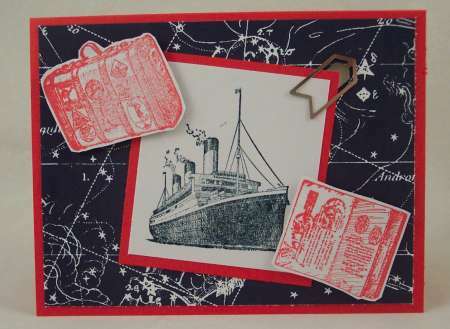 Then I stamped the trunk and passport in red, cut them out and adhered them to my card with foam dots. Starting today you can order all the new products from the Stampin’ Up catalog directly on-line or from your local demonstrator. If you don’t have a demonstrator you can find one here. Hope you enjoyed taking a look at just some of the great new products from Stampin’ Up, check back in the upcoming weeks as I share more ideas.